Gold’s carat (abbreviation kt) is the measure of its purity, with 24kt gold being 99.9% pure. To create 22kt gold, 24kt gold is alloyed with pure silver and copper. However, not all 22kt gold alloys are the same; different formulas (using different proportions of silver and copper) may be used to create different color variations. 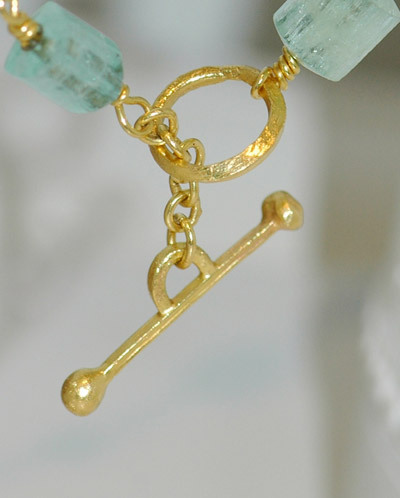 In addition, not all 22kt gold allows for fusing and granulation. All 22kt gold, however, is 91.6% pure. 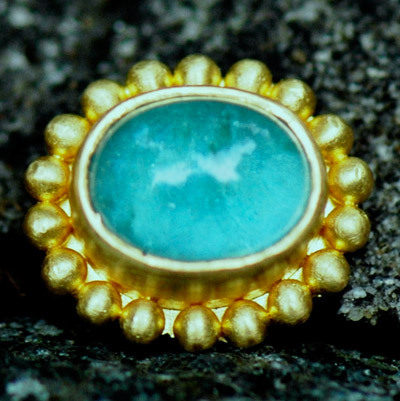 Primavera Design Jewelry works primarily with a specific 22kt alloy that is very yellow in color and that allows for heat fusing and granulation. The following is the list of the modern birthstones. A briolette is an oval or pear-shaped faceted bead. Briolettes are also sometimes known as faceted teardrops. A cabochon is a highly polished, convex-cut unfaceted gem. 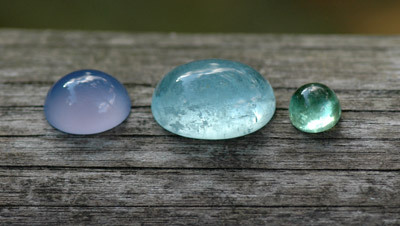 In contrast to faceted gems, cabochons have a smooth surface. Diamonds and other gemstones are sized by carat weight. One carat is equal to 200 milligrams. Carat weight is often abbreviated as cw. In pieces with multiple diamonds, the total carat weight (tw) is often listed. This is the total combined weight of all the stones in the piece. A diamond that weighs .50 carat or 50 points would be considered 1/2 carat in size. A diamond that weighs 1.00 carat or 100 points is considered a one carat stone. A two carat diamond would weigh 2.00 carats, 200 points or 400 milligrams. Granulation is derived from the Latin word granulum, the diminutive of “grain.” In granulation, small round balls of metal are joined to a flat surface of metal by heat fusion. No solder is used in this process. 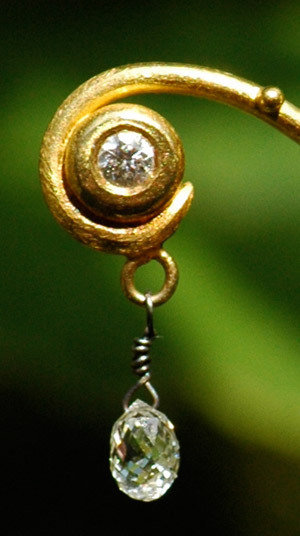 Granulation can be done with some 22kt gold alloys and fine silver (which is 99.9% pure). 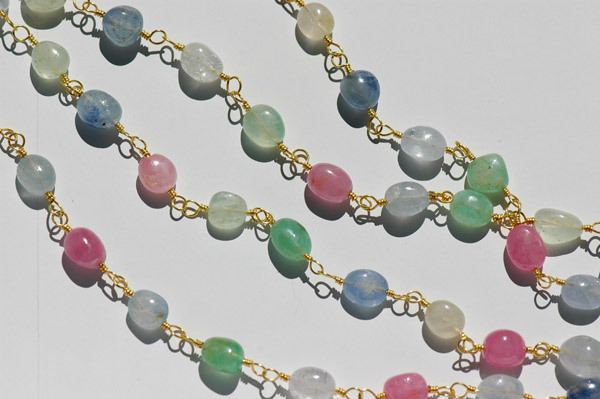 Granulation was used extensively by Greek and Etruscan jewelers as early as 7th century B.C. Hammered gold is a textured finish that is achieved by multiple strikes of a ball-peen hammer. Hammering techniques have been used in jewelry making since ancient times. 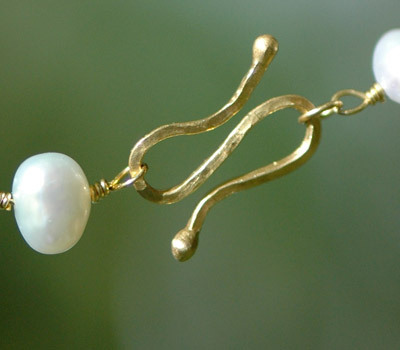 An S Hook is a decorative clasp that consists of one piece of continuous wire shaped into an S shape. The thickness of gold wire is measured in terms of gauges. The larger the number, the smaller the diameter. For example, 2 gauge round wire is thick (like a pencil), while 30 gauge round wire is very thin, like a piece of thread. Gauges 18-30 are most commonly used in jewelry making. Wire wrapping techniques have been used to create beaded jewelry pieces since Sumerian times. An item made to order; a one-of-a-kind piece. Photography is not to scale. Please see item descriptions for size details.